The Society has very special news of a knee-shattering kind! Yes folks, it's true, HRH bestowed a Royal Patronage on us in 1998, and it has been renewed ever since. We all know how busy he is and how many commitments he has, so we appreciate that for him to bestow this accolade is a great honour for us. Prince Charles has long been known as the Goons' most famous fan and we are pleased to welcome him into the Society. Seriously, though, folks, this really is a great honour and puts us in another league. Still the same loveable Society but with added prestige - and a royal crest no less! We would like to thank Prince Charles for agreeing to be our Patron and look forward to the coming years with trembling socks. We all remember that fateful night at the Comedy Awards a few years ago, when our hero, Spike Milligna the well-known typing error interrupted Jonathan Ross' opening speech. Indeed, it will go down in comic history as it succeeded in both bringing the house down at the Awards Ceremony itself (Spike was being presented with a Lifetime Achievement Award) and then dividing the nation into those who adored him and those who wanted his head! 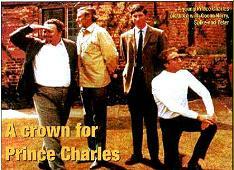 "As someone who grew up to the sounds of the Goon Show on the steam-driven wireless, I must confess that I have been a life-long fan of the participants in the show--and particularly of Spike Milligan, whose wonderfully original humour has always reduced me to helpless hysterics. It is a brand of humour that is gloriously and eccentrically British--if an Irishman will forgive me saying that! It has brought pleasure and joy into millions of people's lives, to the extent that Spike Milligan has virtually become an institution in his own right. For nearly 50 years he has kept us all in stitches. Goodness knows what it has sometimes cost him to do so, but now the remarkable contribution he has made to the life of our country is being recognised by this Lifetime Achievement Award. I hope Spike doesn't see this award as an invitation to retire, because his country needs him! So thank you, Spike, for being so original. This brings you my heartfelt good wishes and warmest congratulations"